*Corresponding author: Ikram ul haq Chaudhry, Department of Thoracic Surgery, Pathology and Hepatobiliary Surgery, King Fahad Specialist Hospital, Dammam, Saudi Arabia. A 30 years old male presented with dry cough, right hypochondrial pain, tiredness loss of weight and appetite over the last six months. On clinical examination there was palpable non tender mass in right hypochondrium, no jaundice or lymphadenopathy. Computed tomographic scan of chest and abdomen revealed a large mass originating in the lower chest wall and compressing the liver. True cut biopsy showed Malignant Peripheral Nerve Sheath Tumor (MPNST). Malignant triton tumor is exceedingly rare subset of MPNST which displays rhabdomyosarcomatous differentiation. Although Mason described this first time in 1938  but the actual term triton was introduced by Woodruff in 1973 based on experimental work of Locatelli who observed a growth of supernumerary limb when he transplanted the sciatic nerve on the dorsal surface of triton salamander . A man aged 32 years, nonsmoker presented with right hypochondrial pain gradually worsening over the last six months. There was no history of cough, weight loss or appetite. On clinical examination there was no cyanosis, jaundice or lymphadenopathy, there was palpable fixed, nontender mass in right hypochondrium. Ultrasound of abdomen showed a large mass compressing the liver. Chest X-ray showed shadow at right lower chest. 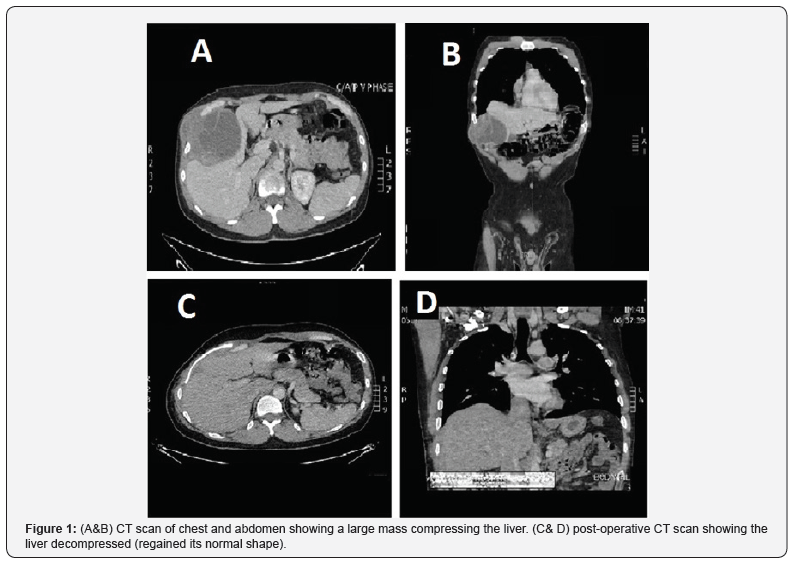 CT scan of chest revealed a large 15x10 cm mass compressing the liver (Figure 1). Basic blood investigations, white cell count, hemoglobin and renal panels were normal but liver enzymes were deranged, Alanine Transaminase (ALT) 45u/lit, Aspartate Transaminase (AST) 24u/LIT, Alkaline Phosphatase 350u/lit. 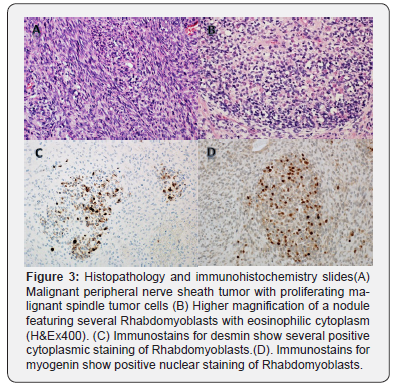 A true cut biopsy histopathology showed malignant nerve sheath tumor and further immunohistochemical stain for desmin show several positive cytoplasmic staining of Rhabdomyoblasts (Figure 2). Further Immunostains for myogenin show positive nuclear staining of Rhabdomyoblasts which are specific diagnostic criteria for malignant triton tumor. 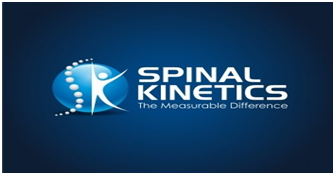 The case was discussed in multidisciplinary meeting and recommendation was to proceed for surgery. Thoracoabdominal incision (extending from right 8th intercostal space to subcostal abdominal area) was given and we found a large tumor arising from 10th intercostal nerve extending in to abdomen massively compressing the liver fig without any liver parenchymal infiltration. Tumor was resected enblock with four ribs and overlying abdominal muscles and part of diaphragm (Figure 2). The abdominal wall defect was repaired with mesh and chest wall defect was reconstructed with methyl methacrylate marlex mesh. Patient was extubated on table and his post-operative course was uneventful. Patient was followed up in outpatient with serial CT scan of chest and abdomen and he remained disease free for one year. Later he developed multiple pulmonary nodules and biopsy confirmed recurrence of malignant triton tumor and he was referred to palliative medicine for further care (Figure 3). The tumors arising from a peripheral nerve or pre-existing nerve sheath tumor such as neurofibroma are all classified by WHO as MPNST . The MPNST originate from Schwann cells or pleuripotent cells of neural crest and accounts for 5% of all soft tissue sarcoma. The incidence of MPNST is 0.001% in general population and 0.16%in patients with neurofibromatosis type 1 NF1 . Malignant Triton Tumor (MTT) is extremely rare subset which accounts for < 10% of all MPNST, it commonly occurs in young population and 50 -70% among those are with NF1 disease [5,6]. Sporadic cases 20-30% has been reported in older age group without NF1. These patients are often asymptomatic for long time unless the tumor enlarges rapidly to cause mass effect or invasion of surrounding structures. CT and positron emission tomography scans are the imaging tools for the initial diagnosis. PET scan is useful to reveal the distant metastasis in addition to the detail of primary tumor. The final diagnosis is based on the histological and immunohistochemical findings . Triton tumor has a very poor prognosis and recurrence rate is very high after surgery therefore radical surgical resection with wider clear margins is the mainstay of treatment. However due to its large size complete removal is not possible in the anterior mediastinum and patient survival is poor. Whatever is the location of tumor five year survival rate is 12-14 %. Although the role of radiation and chemotherapy is not well-defined but still the standard treatment for MTT is radical excision with wide tumor free margins followed by high dose radiation therapy for better survival. There is large case series reported about the poor prognosis associated with MTT. McConnell & Giacomantonio  reported after reviewing the 124 cases of malignant triton tumor that the overall five years survival rate of 14% and median survival of 13 months and local recurrence rate was 50% . MTT is rarely reported in mediastinum, lung and heart (< 10%) . We report a rare case of thoracic malignant triton tumor arising from intercostal nerve presented as right hypochondrial pain and massive liver compression. Initial diagnosis was space occupying liver lesion. 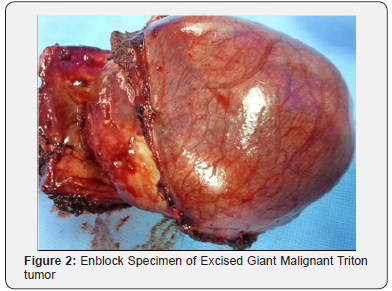 Operative finding showed a giant malignant triton tumor originating from intercostal nerve and protruding into the abdomen compressing the liver. Tumor was excised radically with wider tumor free margins and chest wall was reconstructed. Patient remained disease free for one year after that he had multiple metastases in the lung and was referred to palliative care. In our opinion despite of radical resection with negative margins unexplained biological behavior merits further research to have better survival.